Your first goal is to Finish the quest by any means necessary, this is the hardest part. Next use Reliq on a VETRUVIAN MINION, not a NEUTRAL MINION. Ideally you will have an Iris barrier equipped so you can now fly around the map recurring your deceased minons, each of which have been selected to grant as much value as possible for their cost when recurred (except silhouette tracer). Best targets for Reliq are Ayylmao healer, Allomancer, Wind Shrike or a high attack Portal Guardian. Recurred minion buff Portal guardians Attack, and if a Portal Guardian is recurred then it too gains the bonus attack of any other recurred minions. Ok it’s funny how on the cover page it says it costs, “A lot,” but why on the decklist the spirit is NaN? 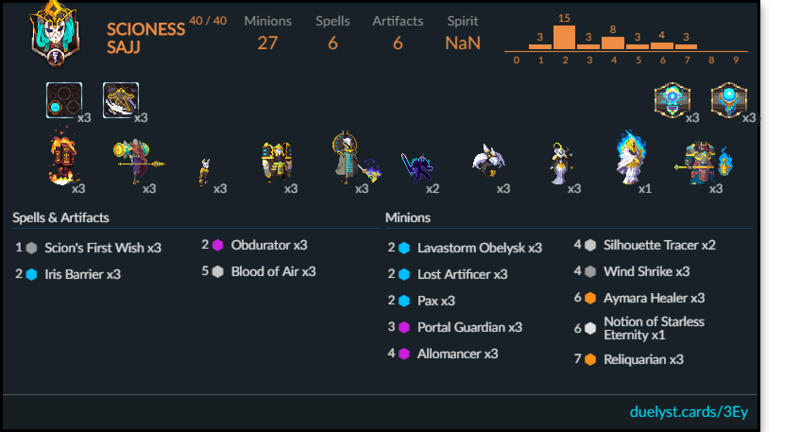 Doesn’t duelystcards always give the correct amount of spirit? A Notion of Starless Eternity deck supported by the very strong Golem package which provide some board contest and card advantage. Flood the board with dervishes, cast Scion’s three wishes, use Khanuum-Ka to clear the board. Then play Pantheran + Reliquarian to revive a flock of Ka’s, and its GG for you.